Why Do They Only Breach Close at Night? We may have to change the name of the blog. It hasn’t rained since we got here. After driving off the ferry in Nanaimo in a torrential downpour, it has been sun and blue sky ever since. It’s wonderful to sit on the deck in just a t-shirt as mid September approaches, though I’m already bracing myself for the inevitable monsoon that I’m sure is coming. The raincoast has brainwashed me. Even when the sun shines, I’m sure mama nature is just piling up additional rain to make up for it. See what you’ve done to me Juneau! There is the small problem as well as the water pressure in the sink has noticeably gotten weaker and weaker in the past few days. All our fresh water is gravity fed from a spring, connected by a never ending tube of garden hoses that wind their way up a hill and through the spruce and cedar trees. There’s just five of us here and any bathing is done via the salt water tub, so fortunately we’re not using much right now. Nevertheless, a nice steady day of rain would help me breathe a little easier. All has descended into relative quiet though. It has been nearly 24 hours since the orcas called, they’re somewhere to the north, suddenly reclusive and introverted after two weeks of tracing the shorelines of Johnstone and Blackfish. The water feels empty without them. Chelsea and I did seem them yesterday on the way into Alert Bay on the weekly pilgrimage to civilization for food and beer. Relaxed and at peace with the world, the A30s and A42s traced back in forth off the north end of Swanson Island near a place called Bold Head. We couldn’t resist stopping to watch. The contrast was shocking. Counting us three boats floated off the island, watching the two pods. 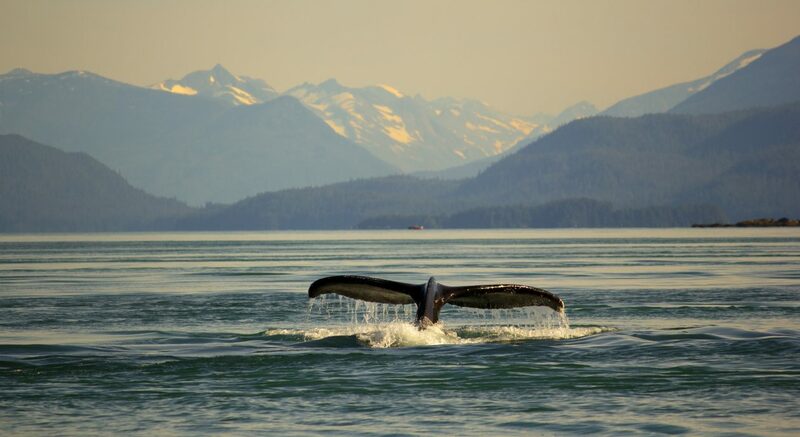 I thought back to what whale watching was like in Juneau when someone saw a six foot dorsal fin. The never ending parade of boats, in a mob like blood thirsty consumers on black Friday. For a moment I felt guilty as I watched A38 rise to the surface off our bow, even from 100 yards he looked massive. After all, I’d been part of it, had taken every opportunity to see the orcas when I could, because, try as I might, I just couldn’t look away. But here there was no ethical battle being waged inside. We were just one of three instead of thirty. We watched the families rise and fall for a few minutes and continued on our way. Even the humpbacks have slowed down, after a week that saw double breaches and a even one surfacing in the cove just feet from shore, their prey must have shifted. But last night, as the tide ebbed and Brittney and I sat in the cabin, a sound like thunder roared from the ocean fifty feet away. There was only one thing that could make water sound like that. We stood on the deck as the moon broke the clouds, illuminating a single strip of the black water below, and a shadow, darker even than the ocean rose. The humpback’s blow echoed off the islands and we could just make out the back as it arched and pulled the flukes into the air. A minute passed before as silent as the night itself, there came a great rush, a blow, and the humpback flew out of the water, its silhouette framed by Parson Island across the pass, the frothy white splash illuminated beautifully in the dark leaped twenty feet in the air as gravity pulled the whale back to the surface. Just another small moment of joy in the world of Hanson Island. There’s little planned between now and the 16th of September when we go from care takers and volunteers, to hosts. Throughout the year, Paul and Helena have been fund raising by offering what they call, “perks.” Donate X dollars, get a CD of orca calls. Donate 5X (see, algebra!) and get a trip to Orca Lab. Cindy and Gene put up 5X, and decided September 16th-18th would be the best time to visit. Paul and Helena politely explained that they’d be out of the country still at the IWC. “That’s ok,” they said. Well than. Hopefully the whales come back and make an appearance for a few days, because theres only so many times we can show them the cedar trees and rubbing beach videos. Of course, if you’re willing to travel all this way, I’m willing to bet you’re perfectly happy to sit in what will still hopefully be sunny weather and watch the humpbacks, sea lions, and harbour seals cruise slowly back and forth in front of you. The night before they left, Paul and Helena gave us a list of tasks and chores to keep the lab running in their absence as well as food and dinner ideas for when our guests arrived. Helena pauses for a moment, “the U.S,” she answers. A wry smile crosses her lips, Paul lets out a little chuckle. “Texas,” she answers.